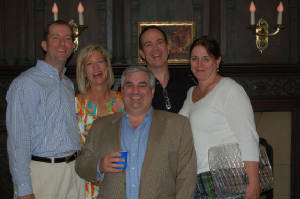 Our 2009 fundraiser was a huge success with 350 people attending! 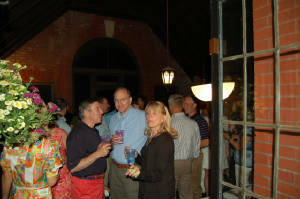 With a record turnout of nearly 350 people, gorgeous weather and a beautifully restored home, the annual Pelham Preservation & Garden Society fundraiser on Saturday, May 30 was a huge success. The organization has adopted the restoration of the Pelham Memorial High School lobby as its signature and the funds raised at this event put the organization well on its way toward its goal to see this project to completion. 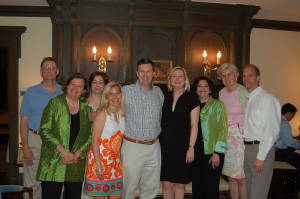 The event, held at the beautifully restored home of Ian and Jennifer Lapey, was truly a community-wide effort. All food and beverages for the event were donated by Board members and community volunteers enabling virtually all of the proceeds from the event to go towards the restoration of the PMHS lobby. Vases of cut flowers from Board Member Ann Jacobi’s garden were placed on the tables and volunteering Pelham teens passed hors d’ovres while John Eicher played the piano for the entire event. It was gratifying indeed to see what Pelham can achieve when all the community comes together. The successful silent auction offered an interesting array of vacation homes stays, art and jewelry pieces, landscaping and gardening consultations by local experts, and premiere goods and services donated by Pelham residents and local businesses. Jennifer and Ian Lapey for opening their home for the event. Ursula Baffuto for publishing the event journal and Blake Bell for providing historic photos included in the journal. Silent auction contributors: Tim and Carolyn Cassidy, Rich Ritacco of Manor Painting, La Gravinese, John Catalano & 1-800-Flowers, Double Rainbow Ice Cream Shop, The Ice Hutch, Pelham Picture House, Paisley Kelling & Ann Marie Pitkin & Kensington Paper, Lieb’s Nursery, Victoria & Joe Klein, Christina & Luiz Correia, Janet Shearn, Cherie Sigward, Bartow-Pell Conservancy, Randy Kran, La Fontanella Ristorante, Mieke & Derrick Dikkers & Le Provencal, Steve Liesman, Missy Fink, Chris & Regina Gallagher, Norah Holt, Michael Schoemaker, Joel Barad, Ellen Albert, Arthur & Barbara Bratone & Bistro Rollin. Dinner Contributions were coordinated by Carol Desmond and Annie Freeman and donors included: Claire Allen, Cara Boyce, Heidi Carey, Cathy Draper, Nora Dodge, Barbara Goodman, Raffaella Gill, Helen Hintz, Jean Ippolito, Susan Mutti, Jeff Monachino, Michelle O’Connor, Julie Roche, Noreen Seebacher, Ann Sorice, Collette Tripodi, Sally Winston, Cynthia Brown, Nanette Connors & Provisions. Volunteer servers included: Gordon Barad, Julia Kavanagh, Caroline Fink, Hollis Kran, Phoebe Merrick, and Samantha Scinta. Pelham Preservation Board Contributors to beverages, dinner and silent auction included: Barbara Bartlett, Jennie Auster, Blake Bell, Violeta Defeo, Aldo DiVitto, Tobe Epstein, Rosemary Hays, Dmitria Holland, Ann Jacobi, Aimee Kaplan, Charlie King, Karyn Pellow, Nigel Scott-Williams, Art Scinta, Tom Shirocky, Maria White, and Hank White. 95 Witherbee Avenue, Pelham Manor is an outstanding example of the "Jacobethan Revival" Style popular in the United States at the turn of the 19th Century. The style borrowed architectural elements from both the Elizabethan and Jacobean styles of English Architecture. 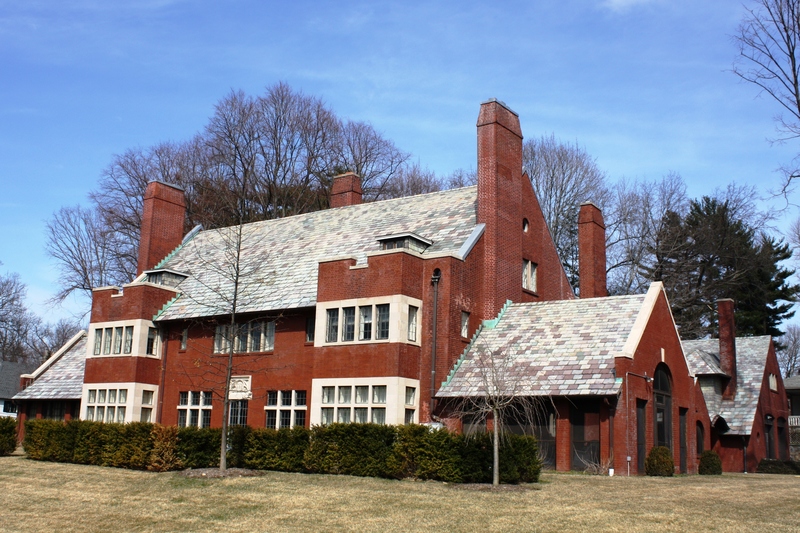 The hallmarks of the style are steep gables and parapets that rise above the roof line, pronounced and tall chimneys, large bay windows often with leaded glass and a combination of brick walls and lighter stone ornamentation, including fenestration articulated and divided by stone lintels, mullions and surrounds. All of these elements are present in this magnificent Pelham home. It was commissioned by Arthur Connors, the operator of a tugboat line, as a wedding present for his daughter in 1915. The home has most recently been purchased and restored (saving it from possible demolition) by the current owners, Ian and Jennifer Lapey.